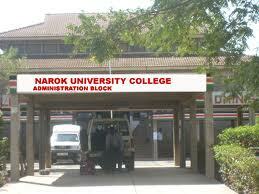 Narok University College was established as a constituent college of Moi University on 16th July 2008. It was initially founded as a campus of Moi University in February 2007 before its elevation to a university college in July 2008. The University College is located along Narok-Maasai Mara National Reserve road and the College has 129 acres of land that is ideal for research, learning and income generating activities. It has modern teaching facilities that support academic programmes. The Environment provide a conducive atmosphere for intellectual activity and recreation in the growing South Rift tourist circuit. The College enhances interaction between researchers and the local community and promotes effective implementation of outreach programmes for sustainable development. There are different arrangements for undertaking studies at NUC. •	Full –Time Studies: These are regular daytime studies that run from 8 am to 3pm, Monday through Friday. •	Part-Time Studies: These are evening studies that run from 5 pm to 9 pm including weekends. •	School–Based/ Sandwiched Studies: Is only available for B.Ed (Early Childhood & Primary Education). They run during April, August and December school holidays, from 8 am to 6 pm. This is only available for all courses for students wishing to study-off campus .The students are given study materials, syllabus, timetable, and fee structure. The student has to meet his/her lecturer physically for six hours per semester. The university college provides bridging courses to candidates who want to improve their specific subjects i.e.Mathematics, Biology, Chemistry and Physics. The establishment of Narok University college comes as a success of the efforts of the Government in trying to decentralise higher education to all regions of the country. Narok University college back to Home page.